This is in line with official industrial production, but July's Markit PMI took a relatively steep slide. 47.9 down from June's 49.9. June's industrial production fell again from its big slide in May, and this report holds out little promise for July. With Philadelphia, Richmond and Dallas all notching significant negatives in July, clearly the only thing to do is buy oil on the theory that the money choppers will be running. Kansas was the best this month, but at 5 with negative shipments, it did show a general slackness. I'm surprised at the Dallas survey - I was expecting at worst a marginally negative headline number. The components are not as disturbing as the headline. Euro retail PMI headlines at 46.4 for July, which is quite poor and a significant decline. Of the big three - France, Italy and Germany - components, Germany is by far the best at 50.3. Yet the German survey is showing real signs of stress, and it may not be above the 50 line in September. In particular, margins are declining too fast for sustainability. France is quite poor at 46.7, a two-point drop from June, but the real news is in margins, which are collapsing. Italy trudges tragically at the rear at 40.7. Italy's curve is now worse than the worst of the 2008-2009 downturn. In short, Q3 will continue and increase the Euro recession. PS: Euro recession footnote - Austria's manufacturing PMI, which had been one of two in Europe to stay above the contraction line, succumbed in July. 50.1 > 47.4. There is no good news for Europe. 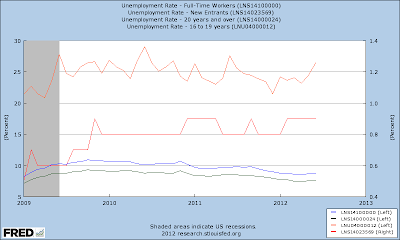 These are graphs of unemployment measures. The red and orange lines are teen and new entrants. The green and blue lines are nominal and 20 years and over. This graph shows how historically high they are this far away from the end of a recession. This is the graph of the same measures since the beginning of President Obama's term. And he keeps giving self-congratulatory speeches? Brilliant policy, but I didn't explain to you dumb asses enough about how brilliant it was, it worked, but you are just too dumb to know it, the private sector is doing fine, etc. This is a lot of human suffering we are looking at, and Obama doesn't seem to realize that it exists. All of these measures are worse than when he took office. He does not make a case for a solution or seem to have a plan to redress the situation. This is the graph of the "big 2", and not only are they worse than at the start of his term, they aren't even going in the right direction! Female head of household looks even worse. 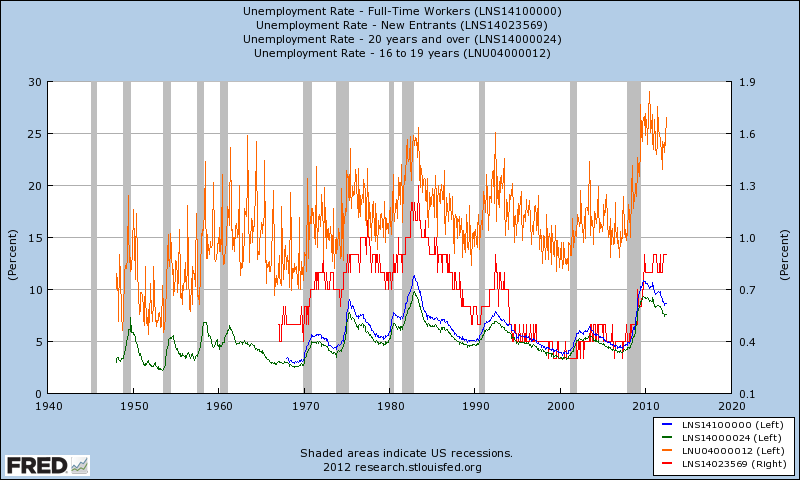 I have changed the red and orange lines so that they now represent unemployment among females who maintain families (orange), and wholesale/retail private unemployment. People have always found him likeable, but that doesn't pay your rent or your mortgage or feed you or give you hope for the future. He is running a terrible campaign, and it certainly looks like the reason is that he is so encased in the warm, loving embrace of a mutual admiration society. And now we get cries of "racism"? No, no, no. GDP is out. This one contains revisions back through 2009. Headline growth for Q2 is 1.5% - not bad for an aging cracker, huh? 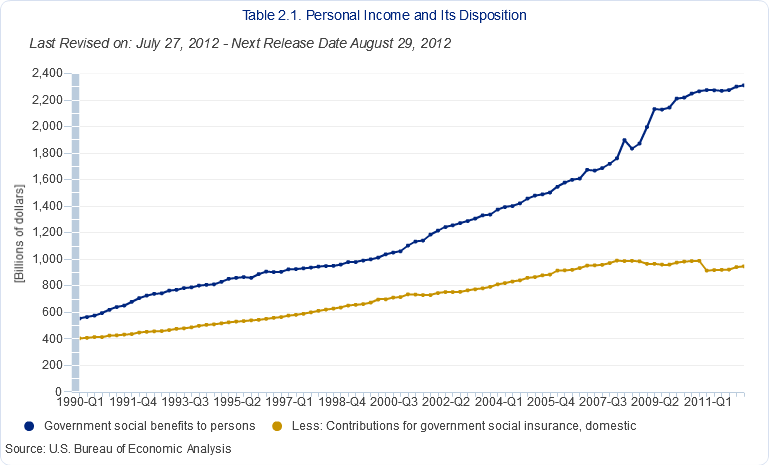 This chart is of real personal income excluding current transfers (blue) and real disposable personal income. These are aggregates rather than per capita numbers. 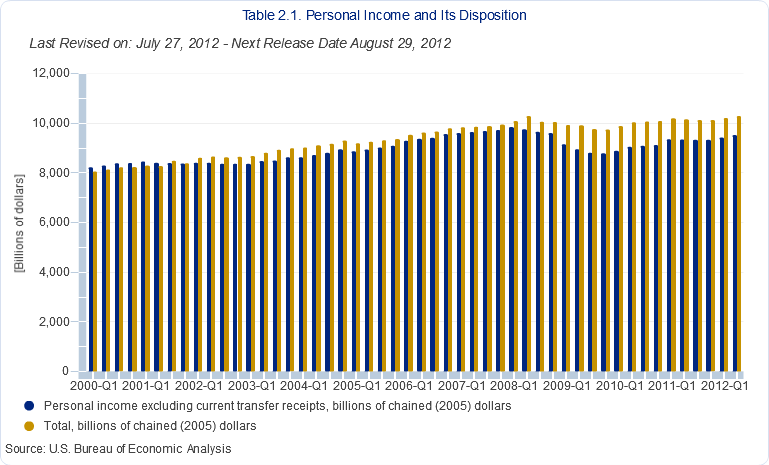 Ex current transfers, real personal income is back to about 2006 Q4 levels. Crikey. 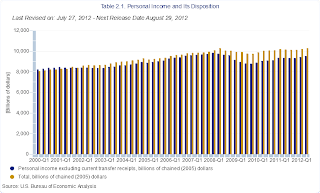 We've made it about back to beginning 2008 levels for real personal disposable income (price-adjusted income less taxes). However most people actually take home less real income that they consider disposable, because of things like higher payments for insurance. And this is not sustainable, because of the funnel. This chart shows government social benefits to persons less domestic contributions for government social insurance. As the gap between the two widens, any hope of containing the US' inexorable rise in Debt/GDP ratio collapses. In the beginning of 1990, the ratio between benefits/payments for benefits was 554/404 = 1.37, or inverted, 0.73. That means that non-income tax payments to the government accounted for 73% of social benefits. At the beginning of 2000, the ratio was 1038/697, or 1.49, or 67% of social benefits. Currrently the ratio is 2,310/947, or 2.44%, or 41%. Somewhat obviously, we cannot come close to closing that gap through raising income taxes, especially if we are not going to raise them on anyone but the rich. The total income of the rich isn't near 2 trillion. How about all those dividends? This quarter, the annualized TOTAL investment income (interest plus dividends) is 1.741 trillion. Even if we confiscated every last cent of unearned investment income, we couldn't close the gap this year. If we raised taxes a net 10%, heavily distributing that to the upper end incomes, we'd only net 174 billion extra. What about filthy rotten slumlords? Total rental income is 455 billion. Hardly a stinking drop in the bucket, even if we take it all. Personal current taxes are 1.474 trillion. Our net deficit is running close to a trillion before we consider the 2014 bust of the Medicaid/individual insurance subsidy impact. So we would have to raise tax rates by about 67% (2/3rds) to come nearly back into balance. The impact would throw us into a massive recession, so we can't do that. It's obvious that neither candidate is willing to talk honestly about the future. It's also obvious to me that Obama doesn't have clue, so that leaves Romney who will be less of a pox upon our economy. But it's blindingly clear that Congress is what matters. They will have to get themselves moving within a few years, or we get to enjoy a European fate, and it's not looking good. To go back to the first graph, we need to grow that blue line. The only way to do that is to adopt a growth agenda, and it has to include some very large shifts in policy. We are now in the government spending bubble. Its demise is as certain as the credit/housing bubble's demise was. Its size is approximate to that of the credit bubble's contribution to PCE. It's kind of painful to look at this thing! Richmond, like Philly, is now in recession territory at -17. Finished goods inventories at 21, while backlogs are -27. So don't look for a quick upswing. I find myself confounded by the negativity on Q2 GDP. Q2, while just slumping along, wasn't bad. 1.6? Thereabouts. It's Q3 that's gonna make us all cry. Down again - this time to 51.8. June's final was 52.5. The expansion in stocks of finished goods reverses the contraction shown in June. That WAS a hopeful sign. Backlogs of work contracted further to a preliminary reading of 48.7 from 49.6. This is the US! You know, the global "bright spot"? Eurozone flash PMIs can be found here. They're as depressing as they have been.No need to dwell on it. UPS reported disappointing earnings and a lower growth forecast. Just to round out the beyootiful picture, Spanish 2 year bond yield, 5 year bond yield, 10 year bond yield. Nothing like a five year at 7.5% and a two year at 6.6% to make you yell "confidence"! We feels it oozing from our pores. We're looking for Apricot ECB Money Scrub to remove that oozing feeling. All the Kool Kids are carefully walking around not saying "Italy", but 2 year, 5 year, 10 year. There is only one question left - does Germany ante up to keep Italy in, or doesn't it? Italy has its boot up Germany's rear. Whichever way things go from here, Germany's gonna be hurtin'. In other words, all things proceed to their appointed end. Meanwhile, our politicians are guiding us to a Euro-style fiasco. What a joyous opportunity! These have a common theme regarding structural economic limits for western societies. The first is an ECB working paper by Baum, Westphal and Rother. There is some discussion of it in this Bloomberg article. Against the background of the euro area sovereign debt crisis, our paper investigates the relationship between public debt and economic growth and adds to the existing literature in the following ways. First, we extend the threshold panel methodology by Hansen (1999) to a dynamic setting in order to analyse the nonlinear impact of public debt on GDP growth. Second, we focus on 12 euro area countries for the period 1990-2010, therefore adding to the current discussion on debt sustainability in the euro area. Our empirical results suggest that the shortrun impact of debt on GDP growth is positive and highly statistically signi cant, but decreases to around zero and loses signi cance beyond public debt-to-GDP ratios of around 67%. This result is robust throughout most of our speci cations, in the dynamic and non-dynamic threshold models alike. For high debt-to-GDP ratios (above 95%), additional debt has a negative impact on economic activity. Furthermore, we can show that the long-term interest rate is subject to increased pressure when the public debt-to-GDP ratio is above 70%, broadly supporting the above findings. The distortions of infinite-Keynesianists have somewhat polluted the culture. Even to call their claims Keynesian is a slander of Keynes, because he never envisioned an infinite accumulation of debt. Keynes thought that the government should deliberately establish a counter-cycle to the business cycle, i.e., that the government should withdraw money from the economy when the economy was running hot, and insert money into the economy when the business cycle shifted into recession. The deficit of the above paper is that is doesn't address the problem of credit bubbles. Both Ireland and Spain had massive credit bubbles centered on real estate, and so if you had looked at their economies at the beginning of 2008, you would have seen very low levels of public debt in relation to GDP. However that GDP wasn't real, so the debt-to-GDP ratio analysis can be misleading. The second paper is Trabandt and Uhlig's FRB paper International Finance Discussion No. 1048. We seek to understand how La ffer curves diff er across countries in the US and the EU-14, thereby providing insights into fi scal limits for government spending and the service of sovereign debt. As an application, we analyze the consequences for the permanent sustainability of current debt levels, when interest rates are permanently increased e.g. due to default fears. We build on the analysis in Trabandt and Uhlig (2011) and extend it in several ways. To obtain a better fi t to the data, we allow for monopolistic competition as well as partial taxation of pure pro fit income. We update the sample to 2010, thereby including recent increases in government spending and their scal consequences. We provide new tax rate data. We conduct an analysis for the pessimistic case that the recent fi scal shifts are permanent. We include a cross-country analysis on consumption taxes as well as a more detailed investigation of the inclusion of human capital considerations for labor taxation. Because any realistic policy options for the US and many other western countries include a combination of tax increases and spending cuts, the issues addressed here are fundamental. The analysis in this paper is done on a household basis model and corporate/associate basis model. Intuitively, higher labor taxes lead to a faster reduction of the labor tax base since households work less and aquire less human capital which in turn leads to lower labor income. We recalculate the implied maximum interest rates on government debt in 2010 when human capital accumulation is allowed for in the model. Table 9 contains the results: the US may only a fford a real interest rate between 5.8% to 6.6% in this case. Most of the European countries cluster between 4% and 4.9% except for Denmark, Finland and Ireland who can aff ord real interest rates between 5.9% and 9.5%. This is good because it addresses the stagnation effect generated by social benefits combined with high taxation of income. The analysis also addresses the tendency of higher consumption taxes to reduce labor income. All the meat and potatoes are in the appendices. 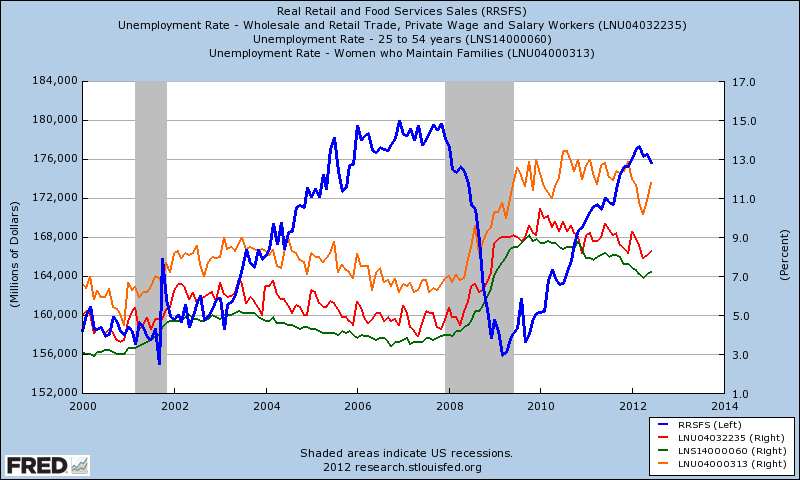 Real retail sales and some key unemployment rates. Good thing there's no correlation! As to the comment about retail earlier, yes, I do believe you are right, John Henry. We seem to have peaked out at levels below 2006. Six years + no growth = Many empty stores turning into many empty abandoned stores. Consider the Pentagon’s bind. According to an analysis by Bloomberg Government, military spending on operations, procurement, research and construction must be trimmed by 12 percent, or $54.7 billion, on Jan. 2, 2013. Over 10 years, the department must cut as much as 15 percent of non-exempt budget items (personnel costs such as payroll will apparently be spared the knife). Oddly, Defense Secretary Leon Panetta has repeatedly said he is “not planning” for sequestration; Jeffrey Zients, the acting director of the Office of Management and Budget, says he isn’t coordinating sequestration planning with other agencies. This might be a bluff, but if they are assuming sequestration will be put off they are betting the nation’s security on the functionality of a Congress that has proved dysfunctional time and again. There has been no planning for what must happen next year, and we have less than half a year to go. Well, continued claims tell an uncomfortable story. Last week's initial claims report looked good, but was attributed to seasonal factors and auto manufacturing changes (which were good news in and of themselves). However this week's report has given back all that goodness, and also continues the string of continued claim rises. Plus, the headline number will be revised upward next week. I'm more concerned about the story the slow rise of continued claims may be telling. 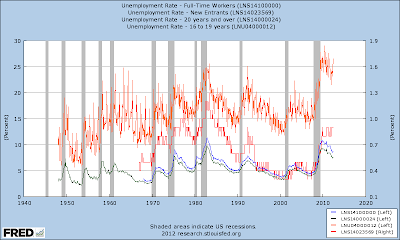 After all, initial claims just tell us about lay-offs. They don't tell us whether the rest of the economy is expanding enough to pick up the slack. Unfortunately, at the end of March SA continued claims had dropped into the 3,2 range for the first time. They rebounded over the following two weeks to the low 3,3s, and then fell into the 3,2s and remained there until late May. Since then they have rebounded to the 3,3s consistently. Labor market conditions are definitely worsening somewhat, and this is a negative consistency which doesn't promise well for Q3, nor for the employment reports in July and August. Now add to that the negative externals, and the picture is quite disturbing. Food prices are on the rise. Commodity speculation is being fed by easing moves from central banks, the expectation of further such moves, and real-world factors such as a poor monsoon in India and widespread drought in the US farm belt. China has been experiencing a multi-year drought in some of its fertile farmland. As for oil, the Iranian embargo etc is being used as an excuse for upward movements. But the reality is that commodities get a relative boost when stocks are constrained by the profit picture and government bonds have already collapsed their yields. Money is flowing to the places of least resistance. This all implies price increases, but it's clear that consumers can't handle price increases, so we are in the land of economic compression and fracture. The commodities are a sucker bet. But we're probably screwed. Only a quick drop in prices could have prevented the diffusion in weakness which would slowly further erode the employment picture in the US. And the US remains one of the world's bright outliers, growth wise. Existing home sales aren't going anywhere this summer, so exuberance is out. What happens to the official unemployment level now depends more on retirements and other exits from the workforce than anything else, but if all else were remaining static, the unemployment level would now be rising. The European thang isn't going to get any better. It can only get worse. Greece is going, Italy will either blackmail Germany into coughing up or it will go, and Spain may have to go now, which is a pity, but could work. But we're looking at severe disorder NO MATTER HOW IT PLAYS OUT. Germany might agree to pay off Italy. If it does, Germany's bonds are going to plunge in value. Greece has no options - it can't raise revenue in a meaningful way. Droughts - well, they are real, and it's up to mother nature. Historically speaking, sacrificing virgins never worked very well, so whatever happens, happens. It is a real constraint, and it comes at a bad time. Oil prices are almost deranged right now, but the money has to go somewhere. Historically speaking, the Fed does not like to announce big moves right in front of an election. It looks like electioneering. Further, the bond purchase program the markets are waiting for would be an economic negative for consumer spending, because it would go into commodities in preference to stocks. Commodity prices are probably the primary force dragging this economy into the ground. Further, the Fed must be very careful. The best stimulus it can generate for the economy is low long rates. It has achieved that, although home sales show the limits of such a stimulant, and bond purchases may tend to increase those long rates. Also, core inflation remains high, and that indicates that a seemingly low CPI is labile and that the Fed can easily juice it. Lastly, the negative effects of a bond purchase program can be somewhat undercut by a weaker dollar which juices exports. However, in the current global environment any such effect will be muted. This economy, both in the US and globally, is trying to come into balance. Trying to destabilize the gyros is not a brilliant move. July is going to be worse. People were actually shopping in June. I talked to a few people in Target looking at school supplies. They were writing down what they have. The women all said they are going to wait until school starts to buy the supplies because they know Target will put everything 50% off and then drop stuff to 75% a week later. Nothing moved in summer seasonal until it was at least 50% off. Reality is asserting itself. People don't have enough money to pay for the inflated prices of everything. Historical 20% profit margins will be coming back to retail. The consumer will no longer pay $20 for an item that was bought by the retailer for $7. The problem is the immense overhead of big retail will destroy it with margins like that. Deflation is the only outcome when the population can't afford anything. At least when the free market allows it. Supply and demand says if nobody buys at price X, you must lower it until somebody does. Was in a local store this weekend. Huge summer clothing clearance sale. Talked to an employee who has been at the same store for 20 years and he said he has never seen so much summer clothing inventory left over or marked down as much as it was. It was finally moving at well over 50% off retail. I believe I mentioned regarding the last employment report that we appeared to be in a consumer recession, but not a manufacturing recession. 6 month YTD = +6.4%. 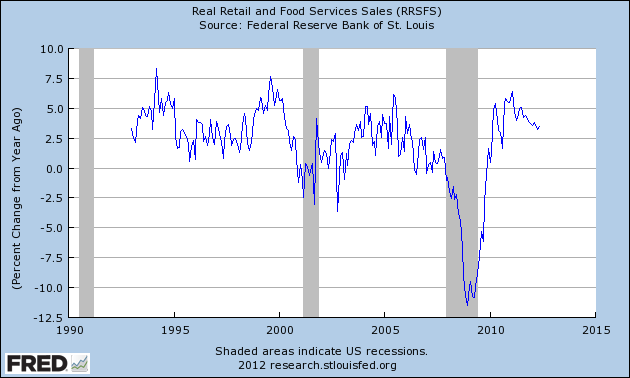 In the US the rule of thumb is that real retail sales need to advance about 1% over the rate of population expansion. We seem to have fallen below that line in the last quarter. The short term data is beginning to develop consistencies. The spike in May revolving credit was due to strapped consumers. The spike in female head of households out of work is largely due to slack retail, and one reinforces the other. What I really don't like is that auto advertising seems to be shifting to the credit downside. This could accelerate the retail downturn over Q3. Now factor the recent sharp drops in some of the manufacturing surveys into the consumer-side picture (for example, the last two months of Chicago PMI abruptly changed trend to came in significantly below the 10 year and 40 year means and medians), and a vision of epic beauty and promise materializes in your mind's eye - if you are a Romney campaign worker, that is. 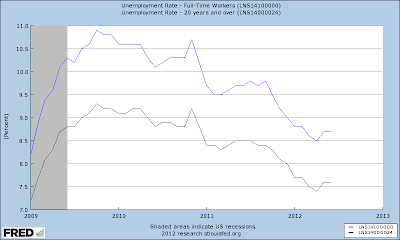 If you are a Romney policy wonk hoping for a job in the Romney administration next year, this is a bad development. Empire State Manufacturing came out this morning, and although it increased, new orders fell significantly, and the headline level is about where it was at the beginning of the last recession. One of my brothers called me this weekend to report on the gun show index, and he told me flatly that it looked like a depression. I never have too much faith in these numbers, but China reported Q2 GDP at 1.8%, which is equivalent to about a 7.3 or 7.4% annual increase. This takes the rolling four-quarter GDP increase to 7.6%. Since we are now at the target levels, everyone anticipates that China will do more stimulating. The question is how much it can do, and what the negative consequences will be. Their last attempt had some very negative consequences, and the current government is reluctant to jump into the deep end of the stimulus pool again. The US has now outstripped the EU as China's largest export market, so the US retail outlook assumes even more significance for China. This is not good news for China! An alternate measure of economic growth trends in China is power output. We only have that through May, but the accumulated (YTD) growth rate and YoY were 5.5% and 4.5% (see the bottom of this release). In the Jan-Feb period the YoY was 9.7%, so you can see that a very real degradation has developed. In May of 2011, the increase was 11% and 10.9%. Singapore contracted in the quarter, due to manufacturing. It was a small contraction, but their YoY real GDP increase is 1.9% following 1.4% in the previous quarter, and this is pretty darned bad for Singapore. However they have capacity constraints of different kinds, and domestically-generated GDP would be higher were this not so. It is, however, a measure of growing weakness in the region. Resulted in a very low 1.459 yield and an epic bid/cover ratio of 3.61. For the 10 year, that's huge demand. Just huge. 30 year mortgage at 3.56%, with 15 year at 2.86%. I forgot - low reported SA claims seem to be a function of seasonal adjustments, so today's initial claims report should be consumed with half a shaker of salt. Unless, of course, you live in NYC, where salt and sugary drinks are illegal or something. Final note: See Snarky Mark's excellent non-revolving debt PER CAPITA chart.A lot of that is college debt. This is consumer non-CC debt that's not secured by real estate. If you want to think of this as if every one-year old in the country is walking around with a $5,500 auto loan, that's pretty close. The parents need to pay the interest on that debt from their incomes, which cuts spending money, which cuts circulating money, which will produce deflation unless either the population expands a lot or production expands a lot. Japan fell into decades of the deflationary zone precisely because of the strategy they followed in response to the demise of the property bubble, which shoved yields down and forced the population to go into Saving-ueber-alles mode. Now Japan seems to be entering the implosion zone, when spending still doesn't increase but society has to start drawing down the savings.That would be quite doable except that the government has racked up a very large public debt and it will be left to a numerically smaller younger generation to pay for it, or for it to be paid for by continuous trade surpluses. Which might be doable considering Japan's economic history, except for the energy problem. The industrial miracle of Japan was dependent on nuclear power. I truly question whether the Fed is now accomplishing anything at all with its attempts to stimulate. They have pushed yields so low that they have created a massive need to save, which would logically send us to the Japanese Twilight zone. Our demographics would have forced some of that anyway - why reinforce the trend? Not content with destroying their energy infrastructure, the Greens in Germany banned the primary agricultural rodent poison in 2008 due to environmental impacts. Farmers already noticed an increase in the field mouse population in 2011 and began to take counter measures. According to Reinhard Kopp, a spokesman for the Thuringian Farmers' Association, agriculturalists set up hundreds of perches in their fields to lure birds of prey to kill the mice. But the operation was only moderately successful. "The birds got so fat from eating all the mice that they almost couldn't fly any more," Kopp said. "But they still couldn't keep up." Instead, agriculturalists want drastic action. They have requested permission to deploy a rat poison called Ratron. Farmers in Germany have been banned from using the poison on large areas since 2008. Ironically, it was the indiscriminate use of Ratron by farmers in Saxony-Anhalt that led the agency to ban it in the first place, after the poison killed wild geese and endangered European hamsters. The pensioners who can't afford to keep their lights on can now snicker at the farmers' suffering. A lot of those receiving the fat solar subsidies are farmers. Of course it won't be fun much longer as food prices rise! I concede that I am not a nice person for laughing so hard, but what did everyone expect? Two hard winters partly shielded the farmers from the results of the rodent poison ban, but this last winter was milder, so the inevitable happened. What they need is cats. Tens of thousands of them. But then the cats would eat the wild birds (think about the US campaign to ban outdoor cats). Also the cats might end the mouse plague, and then the raptors would have to eat kittens. This would cause severe suffering in Germany, where laws protect household rodents from the cruelty of their human roommates. If they do authorize the use of poison, then those fat raptors are going to be fat corpses, because they'll be eating poisoned rodents. Farmers have a lot of clout in Germany, so I presume they'll win this battle, but not before losing a good portion of this year's crop. This morning at about 7:30 there was a big wren convention outside and in the porch. Mama showed up and hopped around the floor yawping with great insistence about something. Outside a bunch of them echoed her comments. Investigations as to marauding cats, reassurance as to the weather report, etc, all produced no amelioration of wren voter sentiment. It was so loud and hysterical that other birds started to fly in to find out what was going on. Well, I had things to do, so I didn't get to NFIB for June until just now. Maybe they had taken a look at it. You know, one of the reasons I figured the US would hold out was the last two months of NFIB data. It looked like small business owners had gotten so lean and mean that they wouldn't have to retract. The headline index fell from 94.4 in May to 91.4 in June. In April it was 94.5, which matched the previous post-recession peak of 94.5 in February 2011. This probably heralds a poor Q3, with a central tendency for auto sales to diminish. The underlying details show what's happening to these stalwarts. Earnings are taking a big fall, with sales taking a less fall. But compensation is way outstripping plans, so these businesses are in the squeeze. This was a significant degradation for this survey, and it strikes a dispiriting note for the rest of the summer. In July we have the big sample size. Maybe things will reverse. Maybe not. May revolving consumer credit, that is. Get the release here. Finance companies, ABS and nonfinancial companies all stayed steady or dropped. The average interest rate for accounts assessed interest hasn't changed much. In May it is reported as 12.76%, and in Q4 it was 12.78%. Finance companies shed balances, and that and the steady rates seem to indicate that it is a charge up rather than an expansion of risk. Tight incomes is my guess. This is really, really in the realm of the "unexpected". Japan announced that May machinery orders dropped 14.8%. The extent of the drop precludes a meaningful revision. Also the May current account balance plummeted. All this as Japan slowly eases into the era when a retiring population begins to draw down its savings for retirements. Most retirement savings are not in the pensions, but in the post office/government bonds. Still, the great shift is imminent. Energy imports are part of the problem with Japan's current account balance. It remains to be seen how Japan will deal with its energy problem - the shut down of the nuclear power infrastructure has created this problem. What they will eventually decide is up to them, but Japan is such an economic powerhouse that one always must pay attention to events there. It is not surprising that PPI would fall if profits are falling. Although I don't know why Japanese May machinery orders collapsed so hard, I have to think it has something to do with both China and events in Europe. One would expect a big rebound in June. But perhaps we aren't going to get that big a rebound; JPM Global All-Industry EI for June hit the stall line in June. Read it and weep. The oil people are still in fantasy land. Take a look at the release and the graph - note the similarity to the 2008 sequence. There's one dip, which occurred last year this time, and then a period of consolidation, and then the second dip. After that, Bad Things Happen. A second, worldwide financial crash is in the offing, and there is nothing anyone can do about it. The banking system is dependent on the ability to accumulate safe, stable reserves, which have in the modern era largely been stored in government bonds. The supply of safe, stable government bonds is running out now. For example, while German short bond yields are remaining in the negative range, longer yields are fluctuating with the economic news. Every time it looks like Germany may take on some real debt to deal with the Euro crisis, Germany's long yields sheer toward US levels. This is all entirely rational. We seem to be doomed to deflation now. The banking system cannot expand lending if it cannot accumulate reserves against lending losses, so modern Keynesian economics just doesn't work in this situation. Forget the Krugmans and their ilk - it's Jack Horner time. The dinosaurs, it develops, are all feathered, and the entire establishment can't see the blindingly obvious. Meanwhile, back at the Euro ranch, Spanish 10 year bond yields continue to flirt close to 7%. This morning they are over 7%, but the finance ministers are meeting. A small wren took up abode in my porch. I like wrens very much. I also like the porch very much. The wren and I had a fundamental disagreement about who had usufruct of the porch, with the wren taking the position that I had the right to maintain it as good shelter from the weather, but only she had the right to occupy it. Anyway, an extended series of negotiations ensued, with a happy outcome. We have agreed to co-occupy, as long as I never sit out there too long. For the duration of the nesting season, I am not allowed to clean the porch. In exchange for this courtesy, said wren is very good at eliminating spiders, so it certainly is not a one-sided affair. One problem is that the wren's nest is built less than two feet away from where my head normally is when I am sitting in my customary coffee-porch position. Out of courtesy, I have moved the sitting stool, but I only did that today when I realized where its nest actually was. I was deliberately not looking due to not wanting to upset the wren. The negotiation process was exceedingly confusing to me, because it often seemed as if I was discussing the matter with two different birds. Not only did the vocalizations change, but the behavior was quite different. Just when it seemed as if we had established a firm agreement (wren flies to door, sits on sill yawping to announce its presence, I vacate the area within a reasonable time), suddenly the wren would fly in from a different direction and hover in front of my face sputtering indignantly. It seemed almost as if the bird even looked different to match its moods! For a while there I was wondering about the incidence of schizophrenia in wrens, but it turns out there is an answer - there are two. One is a Bewicks wren, which is supposed not to be here, and the other is a Carolina wren. I guess the Bewicks got lonely and mated with the Carolina wren. I had noticed the color and tail differences, but I was so confounded about the odd behavioral changes that it didn't click until this morning. This is not due to my great intelligence. What happened is that the Bewicks has laid eggs and is now sitting in the nest on those eggs, so suddenly I was dealing with just one wren flying in and out. The Bewicks, btw, is a calmer bird who makes a much better negotiating partner. We established a modus operandi very quickly. The Carolina wren is considerably more nervous and does not like to sit around chatting with anything as ugly and wretchedly obstructionist as I am. I know because it told me so. The Bewicks and I had initially had prolonged confrontations, but I told it quite firmly that I was no threat to it and indeed would be something of a protector, and within two days it had accepted that. When it reached the peak of nesting frenzy it would fly in and out of the porch right past me. When it had something really long and dangling to add to the nest it would hop around on the door sill and demand that I move, but I guess that was because flying in with something that long would bring the dangling item too close to my head. The nest is quite beautiful, well-woven and mossy. It has one kind of artistic dangling tail on the side. This morning when I realized where it was I climbed on the stool to check, because we had a bad storm and I was afraid my chatty wren had gotten killed. But no, the Bewicks was in the nest, and she squirked sociably to me. I apologized and moved the stool. I find most birds quite sociable, if you know how to talk to them, and amazingly intelligent. The word or phrase "bird-brain" is exceedingly inapt. Gaily through the economic wilderness, that is. The employment report confirms that retail is in a mild recession. Manufacturing is not yet. If you look at the Household survey, the numbers aren't that bad, although certainly they are not strong. 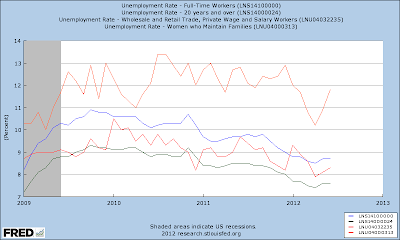 The participation rate and emp/pop ratios are holding, and since April the Household survey reports a gain of 550K jobs. This is not enough to hold the unemployment rate steady because not enough people are leaving the workforce to offset all the new entries. Over these months, the civilian labor force has increased by about 800K. But it is also not the doom-filled picture presented by the Establishment survey. However even in the Household survey the underlying details are somewhat weaker. 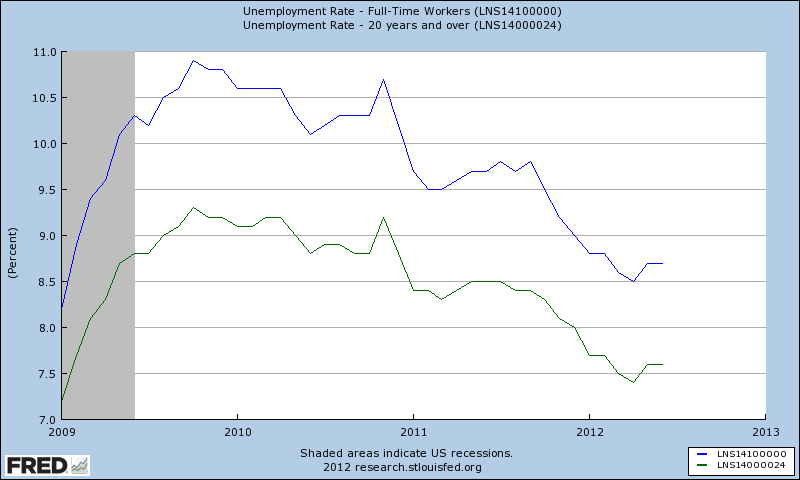 The less than five weeks unemployed number has increased by 10% since April, which is my usual concern level. Not good, but not surprising given the rise in initial claims. 27 weeks and over has increased by 269K. Those employed part-time for economic reasons (unwillingly part-time) have increased by more than 350K, which really cuts into any income expectations created by the gain of 550K jobs over these months. One striking failure of this expansion has been in the creation of living-wage jobs. See Table A-9. Since April, full-time jobs have increased by less than 100K, whereas part-time workers have increased by over 450K. These ratios I do not like. They indicate trouble, especially since the involuntary part-time employment measure accounts for most of it. 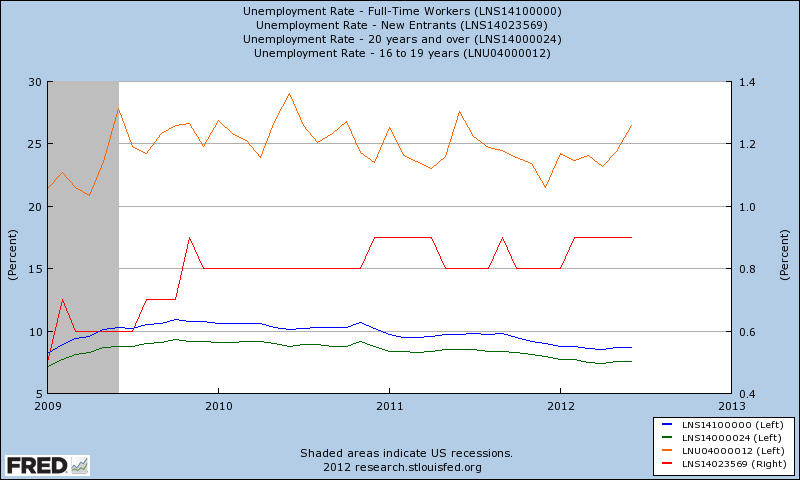 Not surprisingly, since April the unemployment rate for full-time workers has risen from 8.5% to 8.7%. See Table 10. The unemployment rate for women who maintain families has surged. I have some questions about this number, but this is worrisome. In April their unemployment rate was 10.2%, and in June 11.8%. This tally is small, and so the month-to-month variability can be high, but there is a consistency in the reported number I don't like (May had risen to 10.9%) and it is confirmed somewhat by retail numbers in the Establishment report. This number tends to jackknife at the beginning of a recession. It is also well-correlated with consumer credit degradation at banks, so I do watch it. I am not quite hitting the panic button yet, because this isn't SA and some of this comes from school closures, but I will be waiting for July's number with some anxiety. Turning to the Establishment survey, their headline is plus 80K, or 177K since April. This month government reported only a net loss of 4K jobs, so our dear president's recent buffoonery is accentuated. Household survey reports that government jobs, SA, have actually increased since April (see Table A-8). One reason for the up-down effect in this measure is that government workers usually retire earlier, and the wave of retirements is ratcheting up the seeming job losses. But many workers are being hired to replace the retirees. In fact, state and local governments added 3.1K jobs in June. The federal government cut 7K, and I guess most of that is military. There is obvious weakness in retail, transportation and warehousing and information. Information is strikingly weak. Manufacturing of nondurables continues to see jobs ooze slowly away. Construction ain't doing much, and won't. Manufacturing of durable goods is carrying the expansion ball still. 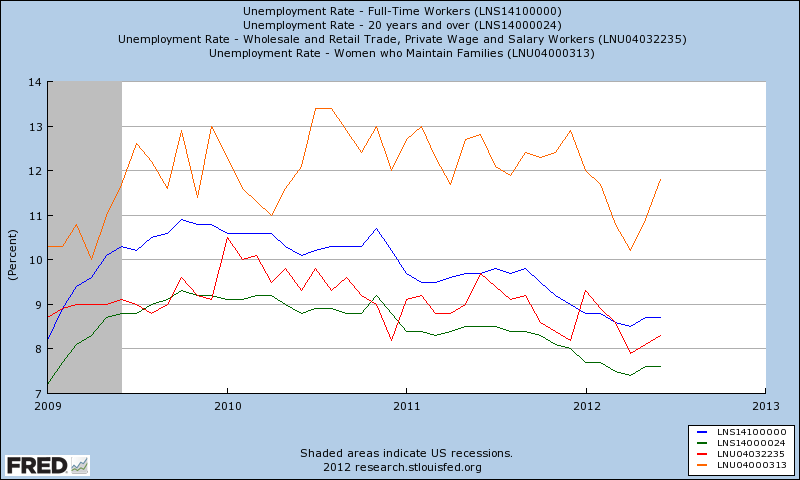 So the ultimate picture I derive is that the economy is expanding in part and retracting in part. I am very concerned about the ability of the consumer to spend. The expansion of revolving credit seen in H.8 is not a good sign at all! It appears that many consumers ran out of money this spring, and I think this is showing up in retail. When Fed Ex and UPS are looking to ramp down and cut costs somewhat, and you see these kinds of job numbers, it's time to get wary. On the plus sign, rail is still decent, and the fact that US consumers backed off the credit so much over the last few years is very helpful. A lot of credit may juice expansions, but it tends to trigger waterfall effects when the economy weakens a bit, and we have very little relative drag there. Forget all the troubles for a day. It's still a great country, with great possibilities. Any time we want to stop shooting ourselves in the foot things will begin to get better again. I think of my parents and their parents, and all of them knew how lucky they were to be here. And they were right. In their childhoods, my parents' lives were overshadowed by the effects of the Great Depression and WWII. It wasn't as if they didn't know how difficult things could be, and their parents had it even worse. The future is in our hands, and things will go as we make them go. That's the meaning of Independence Day - that's the promise. It is all that life could ever offer, and we're lucky to have it. Link to Netanyahu's Fourth of July speech. Construction spending is up, but it probably doesn't mean a whole lot. The May 2012/May 2011 ratio is 7%, but the YTD is +9.4%. Some of that represents seasonal factors, true. Weather was very favorable this year. However housing stats haven't been strong enough to keep us afloat, and that under the very best of circumstances with mortgage rates dropping well below 4%. So residential construction is not a drag, but it's not strong enough to overcome significant weaknesses in other areas of the economy should they develop. And they are developing. The weakness seen in Chicago PMI is now showing up in ISM manufacturing, which dipped to 49.7, mainly on a huge drop in new orders. Both Chicago PMI and Philly Fed moved to recessionary levels in June. In and of itself, that is not enough to take the economy down should consumer spending be solid so services can sustain. That is not such a good bet. US Markit PMI came in at 52.5, still in expansion territory. But it is an 18 month low, so we can take that with a grain of salt. CMI (B2B credit) is decent. Unfavorable factors are the problem this month, which showed only a small overall decline. Of today's reports, this offers the most optimistic outlook. I feel that CMI has been a bit overstated by inflation, which increases favorable factors such as sales and amount of credit provided. With a combined index of 54.5, it's safe to say that this measure of economic viability is still above the recessionary line. Unfavorable factors are at 50.6, which is more of a concern. Last year's downturn did show up in CMI, and this year's June figures are slightly above last June's. Right now B2B credit isn't dragging on the economy as a whole. Europe's dismal performance on the Markit PMIs (read them all here) is no surprise, but with Eurozone at 45.1, and with France and Germany at 45.2 and 45 respectively, it's hard not to stare in aghast horror. Input prices are dropping hard, so we can feel sure that this decline will continue into Q3. Declines in export orders for Europe are beginning to show up in other economies with more force, including the US economy. The ex-Euro bloc is getting impacted, with Poland coming in at 48 and the Czech Republic at 49.4. Indonesia is feeling it now. China is contracting at 48.2. Spain is at 41.1, near Greek levels. With negatives affecting other economies, it is not surprising that the US should be feeling some waves of weakness. This places the focus back on domestic demand. Here is where I am quite skeptical. I think the US consumer is steadily weakening. H.8http://www.federalreserve.gov/releases/h8/current/default.htm has shown a nearly two month trend for consumers increasing their CC balances. Under normal circumstances this might be considered a strength, but I don't think it is because the rate of increase in Other Deposits appears to be declining at the same time. This can't be good, because if more and more consumers are using CCs to get by, those consumers will have to retrench at some point. I am watching deposit growth very carefully. If summer employment kicks in and sustains deposits the outlook becomes more favorable. 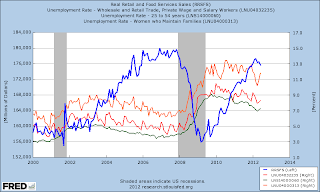 It's very likely that increasing unemployment claims and weakness in employment are producing these results. Again, that does not bode well. This week we have the monthly employment report and car sales. A lot depends on car sales!